In a volatile economic environment, it is of primary importance for decision-makers to estimate the risk associated with each investment. Any exploration or field development decision must be supported by the characterization of the uncertainty on Oil or Gas resources and on the recovery factor. Such uncertainty analyses are based on static and dynamic reservoir models. 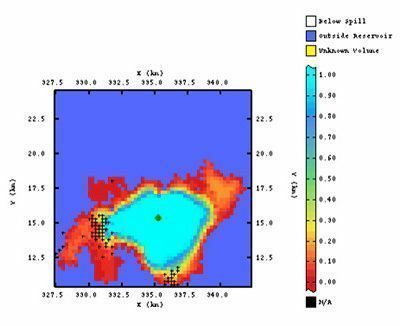 Geostatistical simulation allows characterizing uncertainty at each intermediate step of the reservoir modeling process: reservoir geometry, distribution of properties inside the reservoir, volumetrics. Results can be used in global uncertainty assessments and for evaluating the probability to exceed thresholds. Most of the decisions about Exploration or Oil & Gas field development plans based on geological models are now taken considering different levels of uncertainty: first, the technical uncertainty related to each model component and the resulting global uncertainty; Second, the model response to variations of the economic environment. Kriging provides not only a map of any property of interest, but also the associated estimation variance. It allows definingconfidence intervals or indicators around each estimated point. As kriging is able to integrate auxiliary data and to account for uncertain data, the estimation variance will depend on the number and accuracy of the different data sources. Calculate quantiles (example: P10, P50, P90 on rock or hydrocarbon volumes). Geostatistical simulation algorithms are conditioned to data, thus preserving them. They also allow integrating auxiliary data and mixing certain and uncertain data. Geostatistical simulation is the most frequently used approach for global uncertainty assessment. Each realization can be easily included in global statistical calculations based on Monte Carlo or Experimental Design methods. Geostatistics is mostly applied for calculating uncertainty on geological horizons, on rock volumes, on hydrocarbon volumes or on spill-points location.